This graph shows the residual relative acceleration of the two test masses on ESA's LISA Pathfinder as a function of frequency. LISA Pathfinder is a technology demonstrator mission that placed two test masses – a pair of identical, 2 kg, 46 mm gold–platinum cubes – in the most precise freefall ever achieved, in order to test techniques to observe gravitational waves from space. The results shown in this graph are based on just two months of science operations with LISA Pathfinder. In the top central part of the graph, the wedge-shaped area indicates the original requirements of LISA Pathfinder. Below it, the more stringent requirements for a future spaceborne observatory of gravitational waves are also indicated. The grey, red and blue curves are based on the measurements performed with LISA Pathfinder, which achieved a precision more than five times better than originally required. The grey curve on the left shows the effect of a small centrifugal force acting on the cubes at the lowest frequencies probed by the experiment, below 1 mHz. This is caused by a combination of the shape of LISA Pathfinder's orbit and the effect of the noise in the signal of the startrackers that are used to orient the spacecraft. 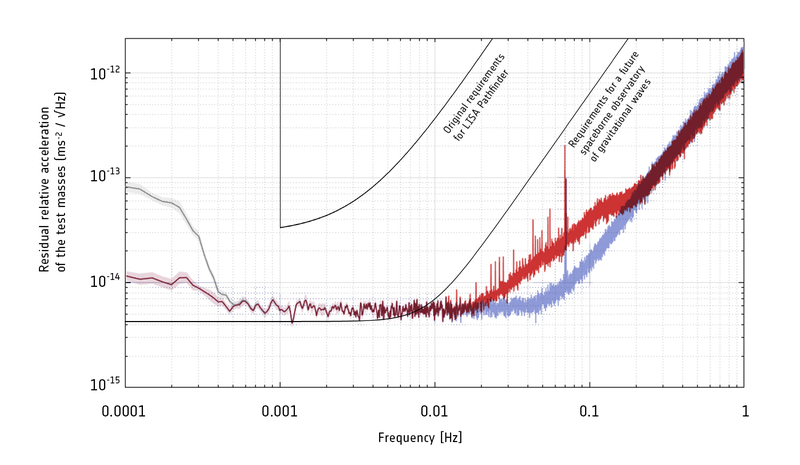 The red curve shows LISA Pathfinder's performance after the contribution of the centrifugal force has been subtracted; the source of the residual noise at low frequencies is still being investigated. At intermediate frequencies, between 1 and 60 mHz (at the centre), control over the test masses is limited by gas molecules bouncing off the cubes: a small number of them remain in the surrounding vacuum. This effect was seen to be reducing as more molecules were vented into space, and is expected to improve in the following months. At higher frequencies, between 60 mHz and 1 Hz (on the right), LISA Pathfinder's precision is limited only by the sensing noise of the optical metrology system used to monitor the position and orientation of the test masses. The cause of the spike around 70 mHz is still under investigation. An additional effect, visible as a bump in the red curve between 0.02 Hz and 0.2 Hz, is caused by a tiny misalignment of the test masses in the two axes perpendicular to the direction of the laser. The blue curve, visible below the red one in this part of the graph, shows the mission's performance after this contribution has been subtracted. These results show that LISA Pathfinder has surpassed its original requirements, reaching a level of precision close to or comparable with to that required by a future gravitational-wave observatory.